A catalogue of all Heart & Sew amigurumi patterns & tutorials. Beginner Friendly: Straight forward, simple pattern suitable for those who know the basics of crochet. Suitable for those new to amigurumi. Moderate Difficulty: Relatively straight forward pattern but beginners may struggle with part(s) of the pattern. Confident Crocheters Only: An elaborate pattern using a variety of stitches & techniques. Julie I am almost finished your little Ballerina Mouse and looking forward to the bears. and can't find it. You work is absolutely fabulous ! Just love it!!! Congrats on the Three Bears. Your patterns are truly fantastic!!! I especially like the Christmas Elf. So adorable. How tall is he? Thank you for sharing your patterns.also your extra work in doing so. Thank you so much! I have looked every where for the perfect hippo, and it was here all along. Have a blessed day! Thank you for the pattern of the mouse love it. thank you for your elf pattern. wanting to know do you do video recordings of any of your patterns.???? Wanted to say a big Thank you for making your patterns easy to read and follow. I've only been crocheting for less than a year and am self taught thanks to YouTube videos. Just finished the adorable mouse and it actually looks like yours so I'm very happy. Can't wait to start the hippo next. Again many thanks from Michigan! I'm a 27 year old pattern designer from Scotland! I love designing cute, crocheted toys. This blog documents my journey in pattern design, come follow me and pick up every new pattern I design for free along the way! Never miss a post or pattern! The information you provide on this form will only be used to provide you with blog updates and exclusive content. Your privacy is important to me! I will never share your details with anyone else. How would you like me to keep in touch? I will email you when a new blog post is published and occasional, exclusive subscriber content. You have successfully joined my mailing list and will start receiving blog posts by email. You can unsubscribe from my list at any time by clicking the link in the footer of these emails. Thank you for your support! 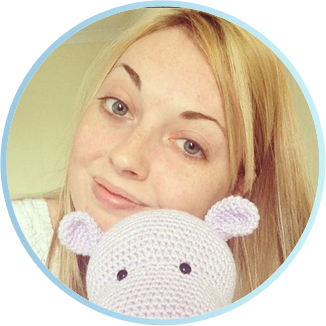 Follow Julie (Craft Pinner)'s board Free Amigurumi Patterns on Pinterest.